Credit: Xiaogang Qiang, University of Bristol. Light may be the missing ingredient in making usable quantum silicon computer chips, according to an international study featuring a University of Queensland researcher. 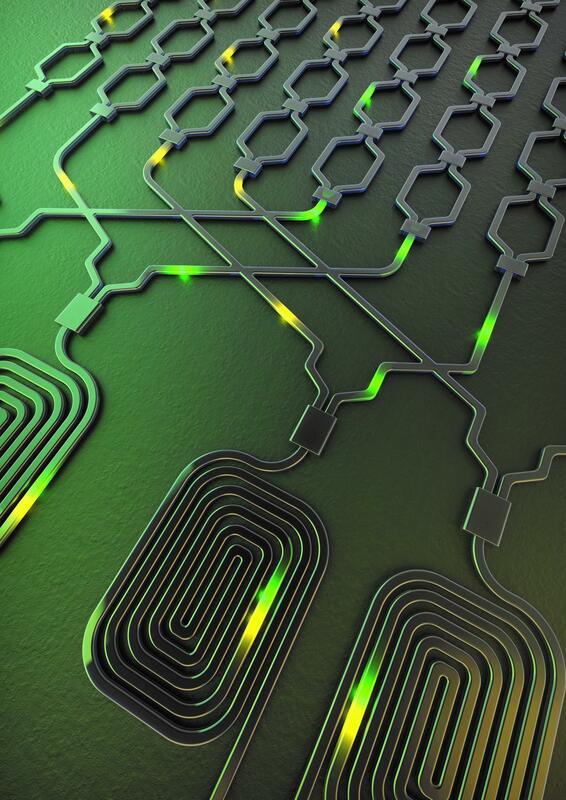 The team has engineered a silicon chip that can guide single particles of light – photons – along optical tracks, encoding and processing quantum-bits of information known as 'qubits'. Professor Timothy Ralph from UQ's Centre for Quantum Computation and Communication Technology said that the use of photons in this way could increase the number and types of tasks that computers can help us with. "Current computers use a binary code – comprising ones and zeroes – to transfer information, but quantum computers have potential for greater power by harnessing the power of qubits," Professor Ralph said. "Qubits can be one and zero at the same time, or can link in much more complicated ways – a process known as quantum entanglement – allowing us to process enormous amounts of data at once. "The real trick is creating a quantum computing device that is reprogrammable and can be made at low cost." The experiment, conducted primarily at the University of Bristol, proved that it is possible to fully control two qubits of information within a single integrated silicon chip. "What this means is that we've effectively created a programmable machine that can accomplish a variety of tasks. "And since it's a very small processor and can be built out of silicon, it might be able to be scaled in a cost-effective way," he said. "It's still early days, but we've aimed to develop technology that is truly scalable, and since there's been so much research and investment in silicon chips, this innovation might be found in the laptops and smartphones of the future." A surprising result of the experiment is that the quantum computing machine has become a research tool in its own right. "The device has now been used to implement several different quantum information experiments using almost 100,000 different reprogrammed settings," Professor Ralph said. "This is just the beginning; we're just starting to see what kind of exponential change this might lead to."